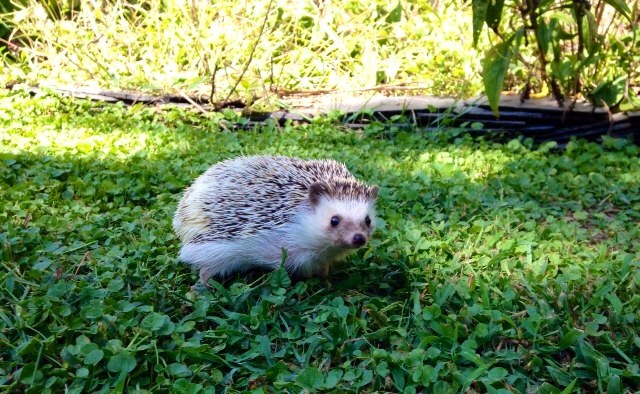 I was enjoying a gorgeous summer-autumn transition day out in my backyard today; the weather was so perfect that I brought my hedgehog out for a frolic in the garden. It occurred to me, as I snapped a photo of Clover enjoying this natural environment, that most people might find this scene a little absurd. When people ask if I have a pet, they are awaiting stories of a dog or a cat. While felines and canines are delightful species, I have always had a special place in my heart for this prickly-yet-adorable insectivore, the hedgehog. The first hedgehog I met lived with its people in an apartment in Buffalo. It was the home of friends-of-a-friend who were hosting a small dinner party. It was a scene worth remembering: a tiny apartment with multiple cats, a dog, and a fully grown rooster living in a cage in the kitchen. The rooster was particularly memorable; our hosts had covered the cage with a towel to keep it from crowing, but as they served up some grilled chicken I couldn’t help but think it was probably best that he couldn’t see the consumption of his own kind. I think I just ate some vegetables and potatoes out of respect. After dinner, they brought out the newest household member, an African Pygmy Hedgehog. It was like love at first bristle. That evening, their hedgehog entertained me with its curious sniffing, its prickly quills, and its cute face and soft, furry underbelly. There was no way I was getting a pet rooster, but the exotic sweetness of the hedgehog had captivated me. Months later, after research and searching, I drove an hour to the country to an advertised hedgehog owner who was willing to sell me a tiny, baby hedgehog. When I arrived I thought: it’s too young, and this place looks horrible. It was, sadly, the kind of place with hoarded animals and run down homes that I don’t like to think about. I bought the tiny, prickly hedgehog that day more to rescue it than out of trust that it was a healthy pet. I named the little ball of quills Thistle and fed him milk with an eye-dropper until he could eat high protein kitten chow. Thistle lived with me in my tiny house, along with the resident cat-in-charge Shadow. The two never really warmed up to each other. Shadow would spend hours staring at the hedgehog in its cage, practically boring holes in it with her squinting cat eyes. I would assure her that I loved them both equally but differently, but she remained skeptical. One day, while Thistle was roaming freely, Shadow showed her disdain by turning around and sticking her backside to the hedgehog’s face. Thistle reacted as hedgehogs do, every quill extending as he curled into a ball, effectively stabbing the cat’s rear end with a hundred tiny pencil points and sending her reeling with a loud meow across the room. At that moment, once I could remove myself from rolling on the floor with laughter, I knew hedgehogs were fully capable of self-defense. Shadow and Thistle co-existed for several years in respectful distance after that incident. Sadly, Thistle wasn’t a healthy hedgehog, and I ended up having to give him injections daily several times a year for a respiratory condition that is genetic with poor breeding. As traumatizing as this was for hedgehog and human, we had three fun years together apart from those treatments. Eventually, I buried my first hedgehog pet in the backyard garden where he loved to roam in the summertime. I spent a lot of years pet-less while moving around the country in graduate school. Two years ago, my daughter became interested in having a pet, and when I introduced the hedgehog idea she was ecstatic. I didn’t know anyone in Virginia with a hedgehog at that time, and it took a while to find a quality, respectable breeder. We found one…three hours away. Undaunted, we made a visit to check it out and found ourselves delighted by the little, prickly creatures and their kind and meticulous breeder. After waiting several months, our Algerian Gray Pinto was born and, at an appropriate time, we picked him up and brought him home. Clover (named for a white patch of quills on his back) became a part of the family. What is it that warms my heart about hedgehogs? Maybe it’s the sweet face and soft underbelly co-existing with spiny quills. It’s also the affectionate yet solitary lifestyle they keep, perfectly content alone while happy to be picked up, too. Thistle had a spot in the crook of my arm where he liked to snuggle. Clover prefers to climb to my shoulder and nuzzle his face between my neck and my ear. Bet you didn’t know hedgehogs were so affectionate, but indeed they are. Hedgehogs are all about embracing duality, as am I. Maybe they are my spirit animal. Clover is a blessed little pet and I am a blessed human to enjoy his company. Literally, he has been blessed the past two years along with all the cats and dogs at my church’s blessing of the animals. Last year, he sniffed away at the boxwood sprig dipped in holy water as our priest said a little blessing, and I thought it was a sight that would have made St. Francis take delight. The year before he was the center of attention as our English born Rector took great delight at the hedgie in the midst of her congregation. How a small, spiny animal can bring such joy is an ordinary kind of miracle. This entry was posted in work and life and tagged african pygmy hedgehog, algerian hedgehog, blessing of animals, hedge hog, hedgehog, pets, St. Francis. Bookmark the permalink.